The factors that dictate the length of your life have little to do with your genetics, but rather, how well you live. Of course, making it to the ripe old age of 100 is much more likely if your parents did it, simple because they might have shared with you some of the traits that got them there. Move around. This goes without saying. Study after study has documented the benefits of exercise to improve your mood, mental acuity, balance, muscle mass, bones, circulation, and on and on. 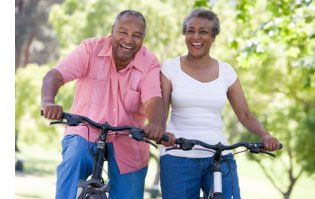 A commitment to lifetime exercise can be your personal fountain of youth. Consume whole foods. Look for colorful fruits and vegetables and dark whole grain breads and cereals with their host of nutrients. Strong evidence suggests that people who have high blood levels of selenium, beta-carotene, vitamin C and E age much better and have a slower rate of cognitive decline. Always stay active, even after retirement. Work in your garden, pursue a hobby, get involved in your community. A mix of activities will help you stay busy and connected. Get at least six hours of sleep each night. Our bodies need sleep for recovery, to regulate and heal cells. Good quality REM sleep is a top priority for centenarians. Floss every day. This keeps your arteries healthy by reducing bacteria that can enter the bloodstream and trigger inflammation that increases your risk of heart disease. Eat high fiber cereal for breakfast. Getting a serving of whole grains in the morning helps elderly folks maintain stable blood sugar levels throughout the day, thus reducing the incidence of diabetes. Chill out. Centenarians tend to be emotionally resilient, possessing a deep understanding of how to cope with their troubles and not harbor patterns of tension. You can find ways to manage your stress by practicing yoga, tai chi, meditation, or deep breathing. Make your social life a priority. Regular contact with friends and loved ones is key to avoiding depression, which can lead to premature death. Connect with someone daily, be it a family member or people you work/volunteer with. Join a book club, a walking group, or meet friends for tea. So, if you want to live a long and healthy life, don't put off tomorrow what you can do today. Make a conscious choice to include healthy habits into your daily routine. Make regular checkups part of your lifestyle. And if in doubt, talk to your medical provider and/or a local health coach to help get you started on the right tract. Our providers at Advanced Healthcare our knowledgeable and look forward to assisting you with your healthcare needs. Our staff includes medical providers, chiropractors, physical therapists, and an acupuncturist who is also a trained yoga instructor and health coach. Back Surgery: Doctors are using more MRI's and detecting more back issues, but the fact of the matter is that many of the issues are very common and treating them with surgery usually doesn't ease the pain. Back strengthening exercises, practices such as yoga and tai chi, heat and ice applications, and other over the counter approaches to back pain are usually the best route unless your condition is extremely severe. Modalities such as chiropractic, decompression traction, acupuncture, and massage therapy also offer tremendous relief. So while surgery may be the answer in severe cases, consider your options before going under the knife. High Blood Pressure Advice: If your doctor is urging you to take medication get an accurate assessment of your risk level, and look into lifestyle changes such as diet, stress relief exercises, and physical activity, before resorting to medication. If your risk level is severe, discuss both lifestyle changes, how they can work with the medication being recommended, and how they can eventually reduce or eliminate the need for medication. Remember, our office staff consists of medical providers, chiropractors, physical therapists, massage therapist, and an acupuncturist. We are happy to discuss your health care needs and find the approach that most benefits you and your lifestyle. During National Chiropractic Health Month (NCHM) this October, the American Chiropractic Association is working with the more than 130,000 doctors of chiropractic (DCs), chiropractic assistants (CAs) and chiropractic doctoral students nationwide to help educate the public and policymakers about the value of a "conservative care first" approach to health care. This health care model encourages emphasis on more cost-effective and safer approaches over potentially addictive medications for pain management and health enhancement. Conservative management of painful conditions may include chiropractic manipulation combined with exercise and stretching prior to moving on to procedures involving higher risk. During NCHM, chiropractors will share information with patients and their communities to empower them to become their own advocates by insisting on information about conservative treatment options. Why is "Conservative Care First" more important today than ever in facing our nations healthcare challenges? Numerous recent studies have clearly shown the dangerous overreliance in the U.S. on prescription painkillers that simply mask pain. This has tremendously increased Americans risk for overuse, and abuse, of these drugs if taken for long periods, leading to more than 17,000 related deaths in 2010 (more than heroin and cocaine combined). The Centers for Disease Control and Prevention calls the abuse of prescription pain medications an "epidemic." Source: JMPT. Vol. 37, Issue 8, Pages 542551, October 2014.